The right time for trekking is between October and April, when it is not too wet. 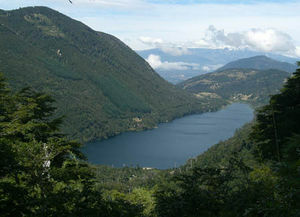 From Temuco to Pucon, are 112 kilometers of paved roads. From Pucón, is 7 miles down the paved road CH-199 international step towards Mamuil Malal, up bifuración where you should take the left towards the lake Caburgua, on Route S-947. 7 kilometers later, there is a new branch. If you take the left, are 6 miles of paved and then gravel road 14 in good to fair condition. 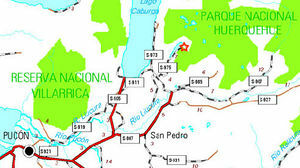 It must move toward the lake Caburgua to a gravel road that goes to the right, sign "The PN Huerquehue." 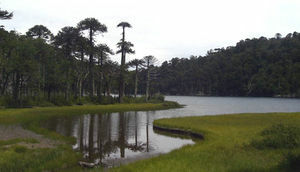 After 8 miles of winding road and several hills, one reaches Paillaco, which must be taken to the left (north) toward the lake Tinquilco. About 4 miles later you reach the CONAF nursery, where you must pay the entry Then you can move 4 miles down the road vehicle to a parking (charged $ 500 for parking), where the trek begins. If you take the right, is 12 miles paved road and then 10 miles of gravel (6 of them shared with the previous route) in regular state. It must move in the direction of the Baths of Huife until 12 miles later, you come to a gravel road which rises to the left (west). It's 4 miles of narrow and winding up caminoo Paillaco, where it joins with the previous route. In January and February, JAC bus operates two daily services from Pucón to the park entrance, leaving Pucon at 8:30 and 4 pm, and returning from the nursery at 10 am and 5pm. Additionally, in summer, buses leave every 40 minutes Caburgua. For about $ 1200 (TBC) allow these buses to reach the diversion that comes to Paillaco (by the first alternative described in access by car). Since there are 14 kilometers of gravel road to the park, along a path that would be quite tiring to walk. The chances for a ride are rather high in the months of January and February, minor in December and March, and fairly low the rest of the year, except for long weekends.
. Then they must pass the turnoff to the waterfall Trafulco (must get to observe). After the second viewpoint, to 1094 meters, the trail increases the slope always zigzag. After about an hour from the Cascade Eagles Nest is reached beautiful Lake Chico. 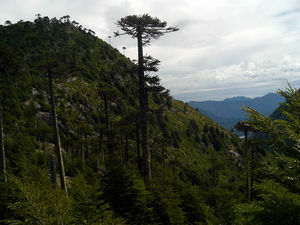 It has reached the plateau of Huerquehue, and thereafter the route becomes rather flat, with gentle ups and downs in the middle of a forest and Araucaria coigües. He must cross a narrow stretch of the Lake boy by a wooden bridge and then around the lake for a nice stretch along the east coast of the lagoon. Just after crossing a tributary of the lake (the stream that drains the lake El Toro) a fork. It should be right. Do not take the path that goes to the left, pointing to "Laguna Verde".
. The land is now open and runs through pastures, some notros bonded and dispersed. Thus began a sharp descent to the campsite Renahue. In the bottom of the descent is achieved Pehuén fork to the right gap. 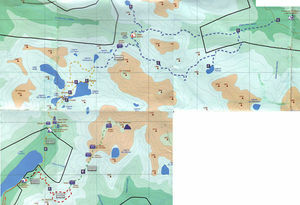 We recommend continuing the path most traveled on the left, toward the camp, which is reached after a half-hour descent. The campsite has Renahue and water tables, but no guards or more services. After crossing the area, there is a sign that says "homemade bread" valley below. However, it must continue up the valley. It may cost a little back on track after crossing the campsite but the footprint is very clear once reunited. Henceforth, the trek will be much less attractive, always moving toward the east. The road climbs sharply first and then more gentle (but persistent) due to step Renahue, shaded by tall trees. The shift is hardly noticeable due to low slope, and begins to fall always on the same landscape. Then the road starts to go down with more pending, and zigzags through the woods. Soon you cross a stream. Then the trail reaches the creek valley and White Pichi becomes increasingly wide, giving way to carts. Even in the flattest area, begin to appear the first houses. 850 meters ahead of them, there is a gate. 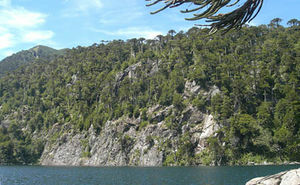 It is here where once reached trail that passed through Laguna Pehuén, which first appeared before camping fork Renahue. It should always follow east along a road and is suitable for vehicles. The road continues down in the shade of peanuts, coigües and laurels, and gives some curves before reaching the White River where there are many spas to choose from (thermal water rights were divided among several brothers of the same family). The author of this review recommends the 'Termas de San Sebastian'. At a normal pace, this should take a few hours trekking between and. To access into the park, each adult must pay CLP $2.500. Aditionally, CLP $10.000 per tent are charged at the entrance to stay in camping Renahue. Sense of route: The normal thing is to make this route from south to north. However, there is good reason to travel from north to south. The camping fee Renahue, perhaps excessive, will be waived. Nor is national park admission charge, but can not be considered as an advantage because the charge is fully justified and contributes to the preservation of the area. Waypoints Huerquehue Crossing Park. To download the file right-click and then select "Save file as" (IE) or "Save link as" (Firefox, Chrome). By trying to open it directly, some browsers will show the raw code with the coordinates.